In the past year, we're seeing a surge of land defense actions in BC and elsewhere in Canada. Zoe Blunt of Victoria Forest Action Network compiled this list to help keep track of current, ongoing, and flying blockades, along with ways to get involved and support the actions. We are ALL BEING CALLED to support these land defenders. To answer the call, email Zoe at wildcoast@riseup.net – she can help set up ride shares and give advice for fundraising. Also see a November 15, 2015 addition of two blockades on Vancouver Island. Injunction and arrests at Shawnigan Lake, Vancouver Island: Community residents, including members of the Cowichan First Nation, are seeking an injunction to shut down toxic soil dumping in their drinking watershed. The dump overflowed during heavy rain November 13, 2015. Meanwhile the company is seeking an injunction to shut down the protestors, two of whom were arrested Noveber 13. Walbran Valley blockade: Members of the Pacheedaht First Nation and non-native environmentalists have built a camp to stop the clearcutting of ancient cathedral forests just outside a park boundary. The Walbran has been the site of massive protests, civil disobedience, and sabotage for twenty years. Ongoing: Coastal First Nations vs. Grizzly hunters. 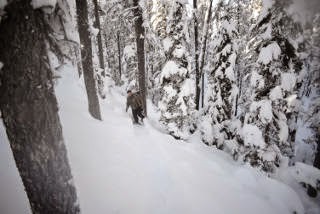 For two years, the Coastal Forest Guardians have been patrolling the central coast of BC and "educating" grizzly hunters and guides about the ban on hunting on their territory. The province continues to issue trophy hunting permits and now the Guardians say they are escalating their enforcement of the ban. Happening now: Ahousaht First Nation on Vancouver Island is using boats to stop a new salmon farm in their territorial waters. Media reports here. Ongoing: Gitdumden Clan of the Wet'suwet'en (neighbours to Unist'ot'en) in Northern BC. They are occupying their territory to block pipelines, logging, and mining. New: Likhts'amisyu Clan of the Wet'suwet'en (neighbours to Unist'ot'en), Northern BC. They are occupying their territory to block pipelines. This is Chief Toghestiy's camp. FB page. Ongoing: Lax Kw'alaams First Nation vs. LNG pipeline terminal, near Prince Rupert BC. The drilling platform was barged into position near Lelu Island in a bay that holds millions of young salmon. The community is mobilizing to occupy the island and surround the barge. News story here. Occasional: Shawnigan Lake, Vancouver Island: The community has been trying to blockade a contaminated soil dump in the drinking watershed for Victoria and the south island. It is largely symbolic but it has potential. News report. One-day blockade near Powell River to protect wildlife. In May nine women surrounded a feller-buncher to stop it from working in a sensitive habitat area. They are demanding logging stop during nesting season, and an end to clear-cutting on the Sunshine Coast. More protests are expected. Nicola Valley Chiefs and locals are blockading a biosolids dump near Merritt, BC and preventing sewage sludge from being trucked into their community. No shipments have made it through the blockade in over a month, and the companies responsible are preparing for a court hearing to have the protestors removed. Fundraising link here. Victory: The Heiltsuk First Nation is fighting for the recovery of herring stocks on the Central Coast of BC. After the feds opened their territory to commercial fishing in March 2015, they occupied offices and set off solidarity rallies. UPDATE: Their blockade is now over and the government has caved in and closed the fishery. The Sapotaweyak Cree Nation in Manitobais protecting sacred sites by blockading workers cutting trees for a hydroelectric transmission line. Ongoing: Burnaby/Langley – KM pipeline: 120 locals and allies were arrested in two weeks at a tarsands pipeline test drill site near Vancouver. In 2015, drillers and surveyors are trying to do their work in various locations but people report their whereabouts and they are confronted and prevented from working. The Kwantlen First Nation is leading the charge for the next round of resistance, which shows signs of escalating further (workers threatened, truck vandalized, equipment stolen). The Nuu-chah-nulth Nations have closed the spring herring fishery in the strait off the west coast of Vancouver Island. They are promising to intercept commercial vessels with their own boats. Blockade down: The Northern Trappers Alliance, a traditional Dene group, was blocking forest roads near Ducharme, Saskatchewan to push back against the loss of wildlife and land to drilling, pipelines, and gates. The protest camp and picket line were moved to the side of the road after an injunction was issued and RCMP seized a trailer. Victory: Tseshaht Nation, Port Alberni, Vancouver Island: Blockade down and victory – the province has agreed to stop timber sales in old-growth forests of the Nahmint Valley. The Tseshaht are monitoring to make sure this agreement is respected. Blockade down: Klabona Keepers, Talhtan Nation (near Iskut) Blockade removed after injunction issued. They were blocking Imperial Metals mine in Sacred Headwaters and other projects in various locations. They are still seeking volunteers, rideshares, donations, and legal help. These traditionalists boycotted the injunction hearing and withdrew for now. Victory: Penelakut (Grace Islet, near Salt Spring Island) Development site on burial ground. Blockade down: The province is moving to intervene and purchase the development site. Sabine Channel (between Lasqueti Island and Texada Island) Oct 4: One-day blockade of coal tanker traffic. Ongoing: Unis'tot'en Camp, (near Smithers) Permanent camp – blocking tarsands and gas pipelines for five years. Get info about the Caravan. Ongoing: Madii Lii Camp (Gitxsan) New permanent camp – blocking tarsands and gas pipelines. Ongoing: Sutikalh (near Lillooet) Permanent camp on St'at'imc territory, blocking resort development for over ten years. We recently highlighted Will Falk’s account as one of the Deep Green Resistance volunteers who braved the January snow and ice to help out at the Unist’ot’en Camp. Max Wilbert wrote another moving personal piece giving an overview of the Unist’ot’en Camp strategy and describing the experience of contributing to their struggle. We pressed on, for our destination was important. It was a caravan to the Unist’ot’en Camp, and we were committed. Read Wilbert’s essay at Deep Green Resistance Seattle: Falling in Love and let it inspire you to support the Camp or another strategic campaign near and dear to you. 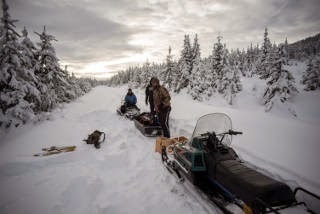 A group of Deep Green Resistance members from across the US and Canada delivered cash donations, supplies, and their labor to the Unis’tot’en Camp in early January. A support network for a strategic, indigenous-led front-line blockade is a crucial part of building a culture of resistance. DGR is proud to provide some of that support, and grateful to the camp hosts for allowing us to be involved. Liz McArthur of Victoria BC is creating a radio documentary on the Unis’tot’en Camp pipeline blockade. She interviewed two fellow volunteers who participated in the summer caravan to the Camp, and a third activist involved with defense of the Sacred Headwaters. The interviews aired on the August 4, 2014 episode of Gorilla Radio. Will Falk of Deep Green Resistance and Victoria Forest Action Network, on his environmental activism with the Camp and other efforts. He discusses the importance of supporting indigenous struggles, and what members of settler culture need to understand and how they should approach such solidarity work. Vanessa Gray, a member of the Amjiwnaang nation in the Chemical Valley of Southern Ontario, describing the horrific conditions of living in close proximity to 63 oil and gas facilities, including pipelines, refineries, and loading docks. Gray describes the incredibly high rates of health problems brought on by this policy of environmental racism towards the indigenous. Gray brought youth to the Camp to show them that places still exist with clean water and air, and to inspire them to fight against the dominant culture of monetary profit at the sacrifice of people and land. John Mowat Stephen briefly talks about activism with the Tahltan First Nation around the Sacred Headwaters in northern BC. Browse all DGR member appearances. Deep Green Resistance stands with indigenous peoples in defense of their land, for both ethical and practical reasons. It’s simply the right thing to do when people are threatened with theft of their traditional land base. It’s also a highly effective way to preserve what’s left of biodiversity and a living planet. Like any long-term member of a community, humans who know they depend on their land for sustenance and life foster its health to the benefit of everyone there. The World Bank calculates that although indigenous people comprise just 4% of the global human population and live on just 12% of the land surface, their territory encompasses 80% of planetary biodiversity. Clearly they’re doing a better job of fostering life than has any civilized culture. We can be most strategic in supporting these people in protection of this remaining biodiversity on their traditional lands. The film series Standing on Sacred Ground explores these dynamics and looks at specific cultures and places in 4 DVDs. You can see multiple excerpts on Youtube, including “Sacred Sites and Biodiversity” featuring clips from Australia, Papua New Guinea, and Ethiopia. We’ve compiled lists of videos we recommend to those learning about radical history and resistance, from presentations by DGR members to fictional films. We have two sets of lists. Enjoy! Deep Green Resistance Youtube Channel features resistance videos with Derrick Jensen, Lierre Keith, Aric McBay, and other DGR members. You’ll also find non-DGR films and music videos with anti-civ analysis and themes of resistance. We also have a set of Deep Green Resistance IMDB lists. These don’t include any actual video clips, but do provide more information on the films, including reviews by other people. I’ve had many opportunities over recent years to attend some of the best training in theoretical concepts and workshops. This action camp provided that and something deeper: a chance to join with those on the front lines, to be a part of actively resisting, guided by people who understand the need to militantly respond to the threats facing the living world. I personally witnessed before my eyes people undergoing radical changes as they saw the material needs for a true resistance as more important than their ideological purity. I spent hours on security, construction, and permaculture tasks where for once the work was more important than group affiliation or rumor mongering. Conversations always took a path towards how the environmental movement needs to start winning offensive battles, crippling the means for those in power to destroy living ecosystems. People new and veteran to this type of work were tossing away the shells of symbolic dogmatism they had long sheltered themselves in, and craving more concrete ways to challenge the dominant culture. I dare say I found a place where my pessimism and extreme caution weren’t a necessary facet of negotiating the world of activism. This is a place to get work done, and there is much work left to do. If you think you can possibly make it to the area, directly support the camp. If you can’t make it in person, donations of money and materials are always needed, and there may be ways to volunteer from afar. Please get in touch!